I have been more than remiss with this book. It was given to me almost a year ago following meeting the author in Boston and it’s taken me most of that time to have the fortitude to open it. I was right as it is most challenging to read. The writing is nicely done, commas, apostrophes and words are all correct it’s just the subject matter being that of the Holocaust which made it so hard to open and read. Let me take you on a journey to explain. 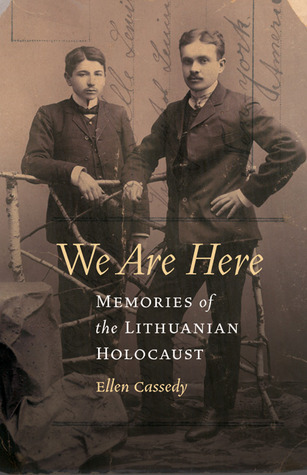 Ellen Cassedy has both Jewish and non-Jewish roots, the non-Jewish come from Ireland, England, and Bavaria while her Jewish mother’s side comes from Lithuania. After her mother died she found herself missing the sound of Yiddish and after a period of study she learned about an intensive Yiddish summer program being offered so she went back to Lithuania to spend a few weeks immersed in Yiddish. Whilst preparing for her trip she was given a troubling family story and she felt she had to try to verify its truth if at all possible and find out more details. This book is her journey back to Vilnius, Lithuania to study Yiddish and find out so much about the Holocaust that she didn’t know, to find out how her family had been involved and to find many more stories that are challenging to hear about. I finished this book a couple of weeks ago and have read a number of other books in the interim but just as I found it hard to start it I also found it hard to even begin to write about it. Even now I’m reeling from remembering some of the stories. How much do I put in here? Do I put in some of the horror stories of mass murder in Lithuania or do I just leave them out and gently suggest some of these stories could be found in horror books? Do I put in some of her family stories about surviving in the Ghetto? They’re of a similar nature to the stories of mass murder and I don’t know how to write about them. In this case I should probably give a few details then leave the rest to you when you read the book. Ghettos were created so Jews could be walled off, the people were not given enough food or water and had to request permission to leave the walls for jobs, there were curfews which were very strict, if you were caught out after curfew you were generally shot, these Ghettos existed throughout several European countries during WWII. Some of the inhabitants were volunteered to be Policemen of the Ghetto, and some may have volunteered themselves in order to save themselves, this was a thankless task and there are many stories detailed in the pages of this book. Truth is often worse than fiction and nothing fits this phrase more than the Holocaust. We keep saying ‘never again’ but then genocides keep happening in other countries. We Are Here: Memories of the Lithuanian Holocaust makes these truths quite clear and we should take the lesson and stop genocide happening again.